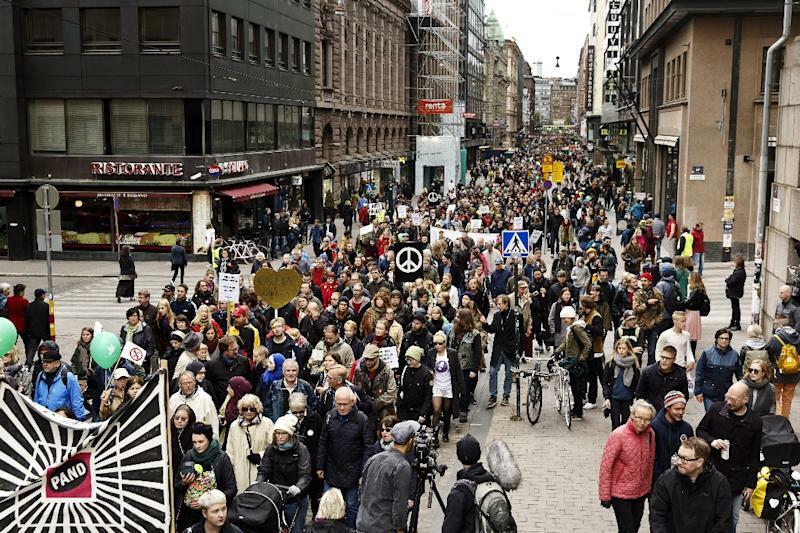 Helsinki (AFP) - Around 15,000 people marched in central Helsinki Saturday to protest against rising racism and violent right-wing extremism, police said, following the recent death of a man allegedly attacked by a neo-Nazi leader. 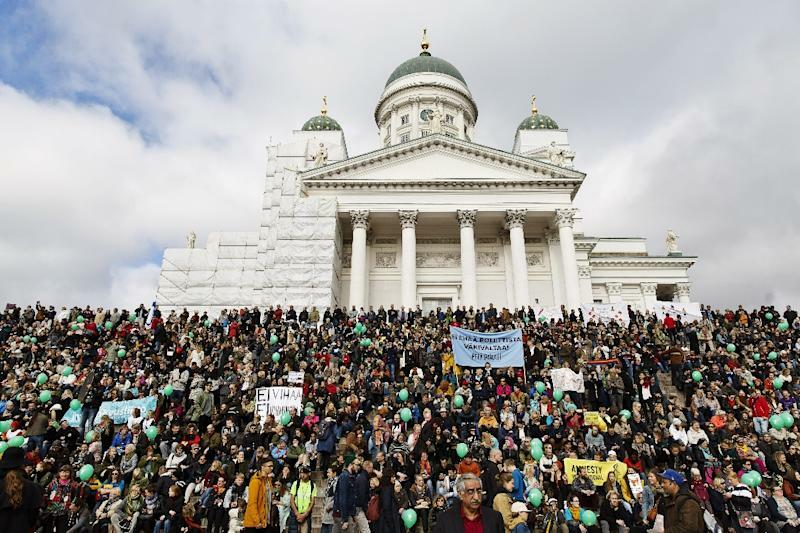 Helsinki police tweeted that around 15,000 people were taking part in the protest, while thousands attended other demonstrations around the country, including Prime Minister Juha Sipila who joined a march in the central town of Kuopio. "People are coming out for the right reason, because the rise of violent extremism is a concern to the large majority of Finns," Sipila told Finnish radio YLE. Sipila vowed the government would soon present new measures to tackle the problem. Several much smaller counter-demonstrations were also held in Helsinki, but police kept the groups separated and no clashes were reported. The main Helsinki protest -- organised by a Facebook group which called the demonstration "Peli Poikki! ", or "Stop This Now!" -- was organised in the wake of the highly-publicised killing of 28-year-old Jimi Karttunen. Karttunen was walking past an anti-immigration protest in Helsinki earlier this month when he stopped to spit in the direction of the protesters. A well-known neo-Nazi leader, Jesse Torniainen, 26, allegedly kicked Karttunen in the chest, knocking him to the ground where he struck his head. Karttunen died a week later of a cerebral haemorrhage and Torniainen, a central figure in the violent far-right Finnish Resistance Movement according to police has now been remanded in custody suspected of assault and aggravated involuntary manslaughter. Torniainen has denied any responsibility for Karttunen's death. The creator of the Facebook group that called the Helsinki demonstration against discrimination said a "culture of silence... has nurtured the growth of fascism and racism". "Violent right-wing extremism has grown stronger and one brave soul that dared to challenge it, has paid the price with his life," the group wrote on Facebook. Politically motivated violence is rare in the Nordic country, but far-right groups have become more active since a record 32,500 migrants sought asylum there in 2015. Volunteer street patrols calling themselves the Soldiers of Odin, with links to neo-Nazis, appeared on the streets of several Finnish towns last year.